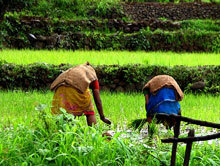 Ever since its inception, the Institute has generated technologies and processes of relevance to Indian agriculture. In keeping with the national mandate and to make the country self-sufficient in agriculture, these technologies and processes were passed on to the farm-related communities free of cost. In monetary terms, the benefits that accrued to the nation must be to the tune of several trillion worth of US dollars. The increased food production through the application of the improved technologies has been the corner stone of India's food security and overall agricultural success. Agricultural Technology Information Centre (ATIC) of IARI is effectively providing products, services and information to different stakeholders through single window delivery system. On an average about 12000 farmers/entrepreneurs/ development departments' officials, students, NGO representatives etc. from almost all the states of country are visiting ATIC for farm advisory, diagnostic services, purchase of technological inputs and trainings. Besides personal visit of farmers to the centre, farmers are also seeking farm advice through Pusa helpline (25841670 and kisan call centre 1551) and letters. To disseminate IARI technologies to the ultimate users ATIC is regularly publishing a Six monthly farm magazine i.e., Prasar Doot which is popular amongst the farming communities. Besides this, publications on package of practices of Rabi and Kharif crops, Fal fool evam Sabjiyon ki Utpadan Takniki are being publishes by the centre. To make the farmers aware about government schemes and facilities, a publication entitled "Krishi evam Gramin Vikas-Yojanayen evam Suvidhayen" has also been published by the centre. "Kisan Jigyasa evam Samadhan" containing the Frequently Asked Questions along with their answers is very popular among the farmers. Farmers who purchase the seed from the centre are provided a leaflet free of cost related with production technology of the crop. ATIC is regularly organizing crop/horticultural, medicinal plants demonstrations in its crops cafeteria so that visiting farmers can see live performance of IARI varieties. Over the period, ATIC through its transfer of technology efforts has developed a number of champion farmers who have excelled in different areas of agriculture and agricultural enterprises. Now they are motivational force for other farmers and working as ambassador to promote and disseminate IARI technologies amongst the farmers of their areas.Information and advisory needs of visitors are also being catered through information museum, plant clinic, farm library, exhibits and biofertilizers etc. displayed in the centre. The demands of IARI products, technology and services are increasing day by day in the market, besides farmers, industry has shown a lot of interest in IARI Research products. ATIC is providing a mechanism for getting direct feed-back from the Technology Users to the Technology Generators. The feed-back strengthened the ATIC activities and provides a ground for need based technologies. The ATIC has also developed functional linkages with various agencies working for the farming community to effectively cater the information needs of the different stake holders. Aromatic fine quality high-yielding rice variety, 'Puss Basmati l' developed by the Institute yields an advantage of 2 tlha at farm level and gives a net income of about Rs. 20,000 per ha. Due to the consumer acceptance, Basmati rice export has increased coincidently over the years. At present, 'Puse Basmai-l' constitutes nearly 60% in terms of volume and almost 50% (Rs. 1000 crores) of the foreign exchange earning through the export of Basmati rice. 'Pusa 44', developed by the Institute for Kerala, Karnataka and Tamil Nadu became very popular in Punjab on account of its stiff stem, non-lodging habit, high input response and suitability for combine harvesting and very high yield potential (10 tlha). Hybrid rice, 'PRH- 10', the first basmati quality hybrid in the world, significantly outyields 'Puse Basmati l' and has been taken up by large number of seed companies. The recently released varieties like 'Pusa Sugandh-2' and 'Puss Sugandh-3' and 'Pusa Sugandh-5', with improved productivity from 2.5 tlha to 5-6 tlha have spread over more than 10,000 ha. Improved varieties of chickpea, pigeon pea and mungbean developed by IARI have contributed significantly to rainfed crop production. These varieties are of short duration and most suitable for crop rotation, leading to increase in foodgrains production and improvement in the protein status in Indian diet. Improved oilseeds varieties developed at IARI have contributed significantly to the national oilseeds production. Widespread adoption of the IARI variety 'Puss Bold', was instrumental to the success of the Technology Mission on Oilseeds. Vegetable varieties and germplasm support of the Institute has led to the development of a seed industry, which has helped in the spread of IARI varieties throughout the country. The cultivation of these varieties is highly profitable to the marginal and small farmers, and generates direct and indirect employment for the rural and urban population. Further, many of the IARI varieties are early or late-sown, giving a price premium advantage throughout the year. This has also diversified the food basket and increased the consumption of vegetables, both in rural and urban areas. 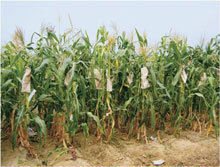 The Institute has developed 200 improved vegetable varieties of 43 crops. More than two dozen hybrids have also been developed in commercially-important vegetable crops. More than 50% area is under cultivation of veg of the Institute. The Institute has developed improved technology for vegetable production like low-cost polyhouse for raising off-season nursery, low-cost polyhouse cultivation technology for high-value vegetable crops, easy and economical hybrid seed production technology in important cucurbitaceae vegetables, onion production technology in kharif season, cauliflower cultivation in different seasons, cultivation of unusual exotic vegetables etc. Growth of the seed industry in the country has been possible mainly due to the availability of high quality breeder seed of more than 160 varieties of field and vegetable crops developed by IARI. A breakthrough in increasing irrigation efficiency was achieved through techniques developed at IARI. The Institute has developed and popularized the High Density Polyethylene (HDPE) pipe-based sprinkler unit. The drip irrigation system developed and popularized by the Institute is contributing significant increases in the area under fruits and vegetables and their production every year. The Institute has designed a prefabricated concrete lining technology suitable for several irrigation projects for the sandy and sandy loam areas of northern India. This technology has the potential to save 5 million ha-m of surface water, which will irrigate 10 m ha of additional crop area and increase foodgrain production by 10m t annually in the country. Technologies, such as pesticidal oxime ethers, alkane polyol alkanoates, azadirachtin and reduced azadirachtin concentrates (insecticides); mancozeb, thiophanate methyl substituted a-pyrones (fungicides), substituted aromatic alkenes (nematicide), Rabdosia based mosquito larvicide, neem oil EW, water dispersible granules of DDT and temephos, floating granules of butachlor, carbaryl EC and controlled release products (pesticide formulations); natural and synthetic stabilizers for azadirachtin, di and tetrahydroazadirachtin, preparation of 5-substituted-1,3,4-oxadiozole-2-thiols as urease and nitrification inhibitors, and trichloro-benzenes (pesticide adjuvants) are available for commercialization. IARI has provided technological support for agro-based industrialization and exports. Rice variety 'Pusa Basmati-1' has led to the modernization of rice mills and exports. The horticultural crops, through increased production, have induced a growth in the processing industry and exports of value-added products. The private agro-chemical industries got a boost from the indigenous technologies for pesticides and agro-chemicals developed at the Institute for commercial adoption. The technology in respect of two bio-formulations, namely, Kalisena SD and Kalisena SL, found effective against c'evastating soil borne pathogens, and promoting plant growth and crop yields, has been translerred to Mis Cadila Pharmaceuticals Ltd. by the Institute for marketing these bioformulations in India and abroad.